Make trips in the car more fun and less stressful by taking a few minutes to pack up some essentials. 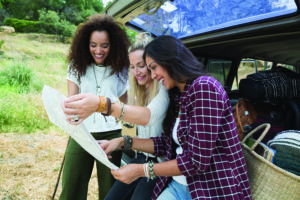 Whether you’re planning a cross-country vacation or just a weekend getaway, packing for a road trip doesn’t have to be a daunting task. Creating a packing list of essentials can be the first step toward avoiding unnecessary stress and making your trip one to remember. Of course, that list should start with the items you should never leave home without like your driver’s license and proof of insurance, but it should also include pertinent information about your destination, like the trip’s itinerary and reservation confirmations. Don’t forget a map or printed directions in case your GPS dies or your phone loses service. In addition to having your owner’s manual and the equipment necessary to change a flat tire, including a lug wrench and portable jack, keeping some additional safety supplies in your vehicle can come in handy in case of a breakdown. Consider including items like jumper cables, a tire pressure gauge, road flares, a poncho, gloves, a flashlight, a small tool set, a small fire extinguisher, paper towels or rags and duct tape. Just as your car may need patched up while on the road, someone in the traveling party may need a little TLC between stops. Some items to include: bandages, aspirin or ibuprofen, antiseptic spray, cotton balls or gauze, tweezers, hand sanitizer, antibiotic spray and bug spray. A road trip is the perfect time to dive into a good book, such as New York Times best-seller and Reese Witherspoon Book Club pick “The Alice Network.” The enthralling historical novel from national best-selling author Kate Quinn tells the story of two women – a female spy recruited to the Alice Network, an espionage ring operating during World War I, and an unconventional American socialite searching for her cousin post-World War II. They embark on a dangerous mission to discover the truth about the betrayal that tore apart the organization, no matter the cost. Learn more at katequinnauthor.com. While cellphones often fall into the “essential” category, there are other devices that can make the miles pass by a little easier, like a laptop or tablet, but don’t forget headphones and chargers for any gadgets you decide to bring. Regardless of where your travels take you, personal hygiene will rank near the top of the list for each passenger in the vehicle. Ensure you’ve got your bases covered with soap, shampoo, conditioner, a comb or brush, a toothbrush and toothpaste, deodorant, shaving supplies, lotion, sunscreen and any additional hair accessories you may need. It’s often cheaper to pack your own snacks at home than stopping at a gas station or a drive-thru, plus you can pack some healthier choices. Consider options such as trail mix, granola bars, crackers, and dried fruits and vegetables, or if you have room for a cooler, consider fresh fruits and veggies as well as some bottled beverages. Long periods of time spent in the car can get uncomfortable, so consider bringing along a neck pillow and blanket to make the ride more enjoyable, and don’t forget to grab an umbrella in case the elements decide not to cooperate.